The historic marker for a site that was once believed to be the ruins of a Spanish mission dating back to the time of Christopher Columbus. In his book, titled Debunking the So-Called Spanish Mission Near New Smyrna Beach, Volusia County, Florida (1941), Captain Charles Henry Coe (1856-1954) demonstrates that the ruins were actually the Cruger and DePeyster Sugar Mill, which was located two miles west of New Smyrna, Florida. For many years, the old sugar mill was mistaken for the ruins of a Spanish mission with origins dating back to the time of Christopher Columbus. The steam sugar and saw mill was destroyed by Native Americans in 1845, just five years after it was erected. Also known as the New Smyrna Sugar Mill Ruins, the ruins are located at 600 Old Mission Road in New Smyrna Beach and were added to the National Register of Historic Places in 1970. Capt. Coe requested that the marker be removed in 1941 and the State of Florida compiled, but little was known about the marker's whereabouts for rest of the century. A few decades after its removal, the marker was recovered and donated to the New Smyrna Museum of History. Original color digital image: Private Collection of Andrew M. Foster. Copyright to this resource is held by Charles Henry Coe and is provided here by RICHES of Central Florida for educational purposes only. 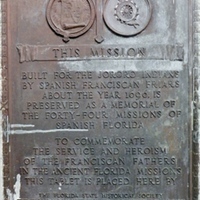 “Spanish Mission Historic Marker.” RICHES of Central Florida accessed April 22, 2019, https://richesmi.cah.ucf.edu/omeka/items/show/6203.